Dr Knox is experienced in ingrown toenail surgery in Perth and has published reference articles on surgical technique for Doctors within the Australian Family Physician Journal. We offer two different surgery techniques to address ingrown toenails which either take place in-office at our practice, or within a day surgery facility. The procedure takes approximately 10 minutes to perform and is usually done under local anaesthesia, or can alternately be performed under sedation. There are two common surgical approaches used to treat ingrown toenails; a sharps nail resection called the ‘Winograd technique’, and a chemical nail ablation called the ‘Phenolisation technique’. Both techniques are equally safe and effective, with large studies demonstrating a success rate of between 90-95% at minimum 10 month follow-up. The sharps nail resection technique is preferably performed for patients who demonstrate excessive tissue growth in the nail sulcus, which results secondary to the chronic tissue inflammation. The technique requires a wedge of nail and soft tissue to be removed from the affected side of the nail, and the skin is closed using stitches. The toe must be kept dry whilst the skin heals which usually takes approximately one week. The chemical nail ablation technique is preferable for simpler ingrown toenail problems which are not associated with any excessive tissue growth. The procedure requires the affected side of the nail to be cut and removed, and a chemical called phenol is then applied to the nail matrix in order to prevent further problematic nail growth in this area. The patient is left with a small wound which takes approximately 2 weeks to heal fully and must be re-dressed daily. During this time patients are permitted to shower and swim, providing that the toe is kept clean and redressed afterwards. 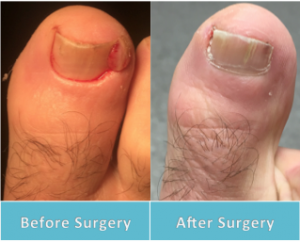 For more information on ingrown toenail surgery in Perth, we recommend making an appointment to see our specialist podiatric surgeon Dr. Andrew Knox.